Many people have heard about orthodontics before: treatments that help improve the straightness and alignment of the teeth as well as other structures of the mouth. These orthodontic treatments can be very effective, but they do take some time (often several months to a year) to complete full treatment. Yet there’s another option to consider that can have just as drastic an effect on the appearance of your smile in only a fraction of the treatment time: instant orthodontics. When you meet with a skilled San Diego cosmetic dentist, you’ll be able to learn more about instant orthodontics and how it can benefit you. For the time being, we’d like to look at the basics of instant orthodontics and how your smile can look far better than you could ever imagine. What does instant orthodontics refer to? 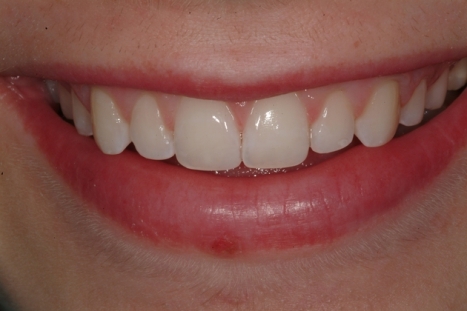 Instant orthodontics refers to the use of porcelain veneers. Also referred to as dental veneers, San Diego porcelain veneers are thin shells of specially crafted dental ceramic. They are semi-translucent just like natural tooth structure. This means that when they are in place, porcelain veneers will blend in with your natural teeth whether you are in artificial light or natural light. Rather than replacing the whole tooth as in restorative dental care or using brackets and wires as in traditional orthodontic care, are simply affixed to the front portion of the tooth. By doing this, the dental veneers are able to achieve excellent results immediately once they are placed. That’s where the “instant” part of “instant orthodontics” comes from. The first step of the porcelain veneers procedure is the removal of a small amount of tooth material from the front of the tooth. 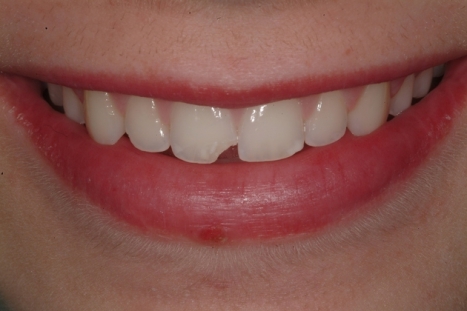 This is generally less than half a millimeter and is only removed to accommodate the porcelain veneer. An impression is then taken of this prepped tooth, and from this impression the porcelain veneer is crafted. When the final porcelain veneer is ready, your La Jolla cosmetic dentist will make final adjustments to the veneer to ensure it matches in terms of color and fit. The porcelain veneer is then carefully adhered to the tooth. This is all done in just one or two dental visits. The best candidates for porcelain veneers are people who have minor aesthetic dental problems listed above. They should be in otherwise good dental health since the teeth need to be in good condition to prep for the porcelain veneer. Patients need to also have realistic expectations about porcelain veneers and what they are able to achieve; realistic expectations means better satisfaction with the procedure. For more information about porcelain veneers and your many other options for advanced smile makeover treatment, be sure to contact our La Jolla cosmetic and restorative dentistry center today. The entire team here looks forward to meeting you in person and helping you achieve the best possible dental health.